The Alaska-Klondike Diary of Elizabeth Robins. Richard E. Bennett was head of the Department of Archives and Special Collections at the University of Manitoba from 1978 to 1997; since that time, he has been Professor of Church History and Doctrine at Brigham Young University, Provo, Utah. His most recent book is We’ll Find the Place: The Mormon Exodus, 1846-1848 (1997). Heather Devine is completing her PhD in history at the University of Alberta, focusing on Metis ethnogenesis in Western Canada. She has an article forthcoming in Ted Binnema, Gerhard Ens, and Rod Macloed, eds. From Rupert’s Land to Canada: Essays in Honour of John E. Foster (2001). Kuldip Gill, PhD, is an anthropologist and a poet. Her first book of poetry Dharma Rasa was published by Nightwood Editions (1999) and was chosen for a BC 2000 Book Recognition by the Provincial Government. She is presently translating verse from Punjabi into English in the Creative Writing Department at UBC. Arran Jewsbury has a BC (Honours) in history from the University of Manitoba. Tom Morton taught social studies at John Oliver Secondary School in Vancouver until recently. He is currently a Faculty Associate in the faculty of education of Simon Fraser University. In 1997, Tom Morton received the British Columbia Social Studies Teachers’ award as “Teacher of the Year.” In 1998 he was awarded the Governor-General’s Award for Excellence in Teaching Canadian History. He is the author of numerous articles, textbooks, and teacher’s guides on social studies. Charlene Porsild is a native of the Yukon and currently teaches women’s history and western history at the University of Nebraska. Her recent book, Gamblers and Dreamers: Women, Men, and Community in the Klondike (1998) won national awards in the United States and Canada. In May 2001 Dr. Porsild will take up a new position as Director of the Library and Archives at the Montana Historical Society in Helena, Montana. 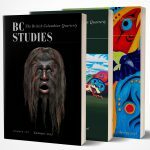 Gerald E. Thomson has a Ph.D. in the educational studies from the Univesity of British Columbia. He teaches in School District No. 36 (Surrey). He also teaches a summer course for the Faculty of Education at Selkirk College in Castlegar.